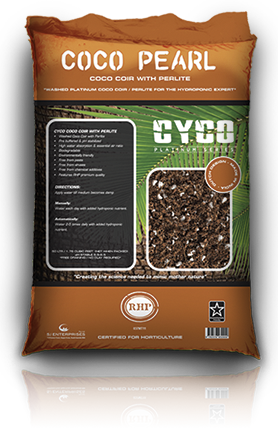 Cyco Coco Pearl is a mixture of Coco Peat and Perlite. Our product combination is able to display the RHP stamp of quality as both the Coco and Perlite are sources in Europe and are both RHP certified. The combination of the two RHP certified product gives us a superior blend for serious growers. Our customers now rely on the RHP standard as a sign of excellence. Only premium Coco Peat products carry the Dutch seal of approval. The RHP Certification ensures the quality and consistency of our Coco Peat products. Cyco Coco Pearl is a clean product that is free from harmful parasites and diseases, and we guarantee to deliver the best possible medium available to you. 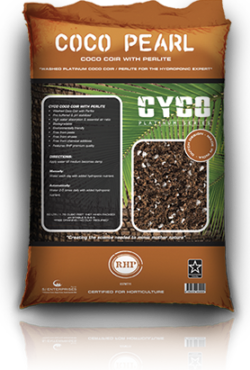 Description: Cyco Coco Pearl is a mixture of Coco Peat and Perlite. Our product combination is able to display the RHP stamp of quality as both the Coco and Perlite are sources in Europe and are both RHP certified.